Do you feel that your ears are blocked and your hearing a touch muffled? It could well be that your ears are impacted with wax. At Top Health Doctors, we have an advanced ENT microscope combined with a gentle suction unit. These are used to diagnose a range of common ear conditions and to help us better manage your ear and hearing conditions. Cleaning out ears under an ENT microscope is generally well tolerated, safe and efficacious. It also has the advantage of not exposing the ear to water / moisture and is associated with a lower frequency of infections (compared to traditional ear syringing). Please book to see have your ears assessed and cleaned by our doctors using an ENT microscope. We strongly suggest that you use Ear Clear (Carbamide Peroxide) or Waxsol or similar wax softening drops for 2 to 3 days before ear suction as this aids in softening the wax, thereby making it easier to remove. Please do not use if you suspect your ear drum is perforated or if discharge is present. Do not use if there is pain or if ear surgery has been performed within the past 6 weeks. Below is a range of common ear conditions diagnosed and managed by ENT microscope. 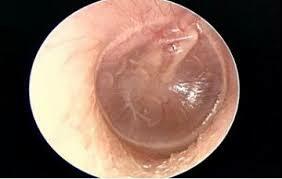 All pictures taken are close up pictures of the ear canal, looking towards the ear drum (otoscopy pictures).